Whether you prefer natural products for your dog, are a regular DIY'er, or just want to save some money, making your own dog shampoo is one way to accomplish all three. The ingredients may already be in your pantry, and if not, they’re easy to find in stores. They’re as basic as baking soda, vinegar, and ordinary dish soap. One thing you don’t want to use is shampoo made for humans. The pH level of our skin is different from that of dogs: ours ranges from 5.5-5.6, while dogs’ pH is between 6.2-7.4. 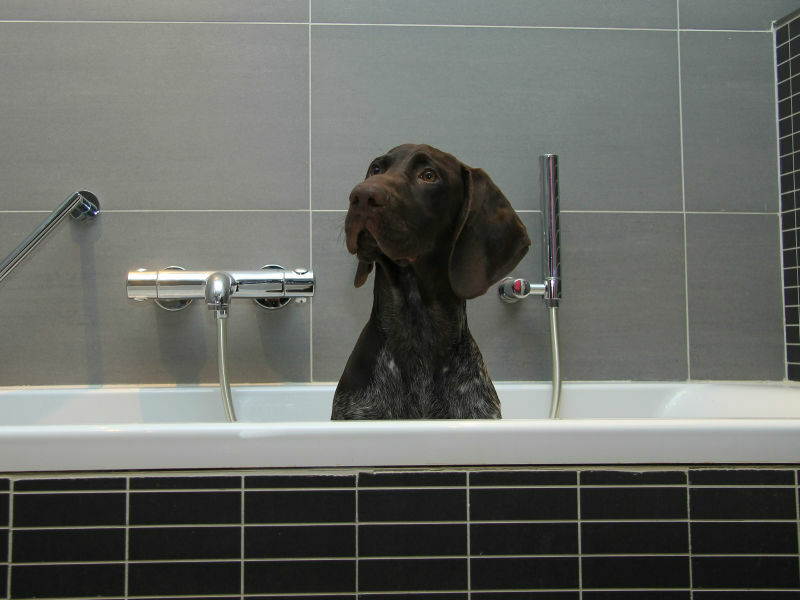 Human shampoo will be too acidic for dogs and can cause skin irritations. If you’re going to mix up your own dog shampoo, you’ll be aiming for a pH level around 7. Luckily, others have done the math for you and devised simple homemade dog shampoo recipes. Dish detergent is formulated to cut through grease and will do a great job of washing away oils that accumulate on your dog’s coat and skin. White vinegar has antibacterial and deodorant properties and will leave his coat shiny and clean. Just be careful not to get any in his eyes. Combine all ingredients in a spray bottle and shake to mix. Then wet your dog’s coat with warm water and spray with shampoo, avoiding his eyes. Work the shampoo into his coat, creating a thick lather. Rinse thoroughly and repeatedly, even if you think all signs of shampoo are gone. Then dry him off, and he’s good to go! If your dog has itchy, dry, or sensitive skin, there are a few things you can add to the shampoo to relieve his symptoms. You can make a shampoo that has glycerin, which can be found in pharmacies, some grocery stores, and online and aloe vera gel. Or you can make an oatmeal shampoo. Oatmeal is known for its soothing properties and is found in many commercial grooming products. You can even use homemade dog shampoo to fight fleas. The trick is to add lavender essential oil, which is thought to be a natural antiparasitic and antibacterial. Some DIY'ers combine several oils, including peppermint, eucalyptus, rosemary, and lavender, but if you have to choose just one, lavender will do. It's important to note that not all essential oils are acceptable. Some dogs have severe toxicity and immune-mediated reactions after exposure to some essential oils (potpourri being the worst). Never apply 100 percent essential oils from aromatherapy products on your pet, especially on broken skin. Also, make sure your dog doesn't ingest essential oils. If you have questions, always contact your veterinarian.